Ignition Wins the Oracle Duke's Choice Award for "Innovative Industrial Software"
At the JavaOne conference this month, Oracle awarded Inductive Automation with the Duke's Choice Award for innovation in the industrial software industry. The award is handed out yearly to companies that make excellent use of the Java programing language to innovate new software solutions in their industry. Past winners of the award include Motorola, Apache and CERN. Inductive Automation won the award because of their work in creating Ignition, the first Java-based HMI (human machine interface), SCADA (supervisory control and data acquisition) application in the industrial software industry. In creating Ignition, Inductive Automation was the first private company to implement the OPC-UA standard in Java, effectively extending the use of Java into the manufacturing industry. Inductive Automation's lead software developers, Carl Gould and Colby Clegg, were on hand at the event to accept the award. "Receiving the award was an honor, I couldn't help but feel a great sense of pride in being a part of the development of Ignition,” said Gould. “It's such a unique product, and so different from any other HMI/SCADA product on the market.” His colleague Clegg elaborated on that point: "Ignition is very different – and this award says to everyone that it’s different in a good way." Platform independence, web-based architecture, unlimited clients, and the quickest installation in the industry are some of the aspects that make Ignition so different – and now award-winning. Ignition users have been lauding these differences for years. The receipt of the Duke's Choice Award is a testimony that large companies outside of the industrial industry, such as Oracle, are taking notice. Ignition is special, and having Java at it's core is a big reason for that. The decision to use Java as the platform for Ignition was not an easy one; and not one that was made lightly. Gould explained: "We knew that we wanted to keep everything unified and simple. To do to this meant that we needed to use one programing language for everything. We considered several, but Java offered the most potential advantages to Ignition users, so that's what we went with." The major advantages Gould alluded to were platform independence, quick deployment, and excellent support. Java's famous slogan is "Write once, run anywhere." This means that programs written in Java, such as Ignition, run equally well on Linux, OSX or Solaris as they do on Windows. Using Java to write Ignition gave it true platform independence, offering Ignition users the freedom to run it on whatever operating system they want. 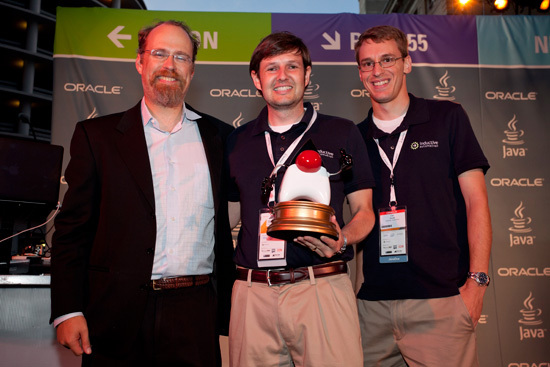 On Oct. 2 Inductive Automation was awarded the Duke's Choice Award at the JavaOne conference in San Francisco, Calif. Colby Clegg (center) and Carl Gould (right) receive the award from Adam Messinger, Vice President of Development for Oracle. Java's Web Start technology has the ability to launch full-featured applications like Ignition with a single click from any web browser. From the beginning, Ignition was intended to be a server-centric, web-based application. Java's Web Start feature helped give Ignition the power to quickly deploy an unlimited amount of clients to any computer equipped with a web browser. Another strong benefit is the stability of Java’s long-standing support. The Java programmer community is 9 million strong – it's the most used programming language in the world. Oracle purchased Java from Sun Microsystems and since has worked to continually expand Java's power and reach. All this means that Java is a very well supported and a growing language, making it a solid platform on which to build Ignition. While choosing Java as the platform for Ignition gave it several advantages over competing applications, it was not a choice that was free of risk. Colby explains: "Nobody in the industrial software industry was working in Java, we were the first ones, so we were breaking new ground." The risk paid off, and Ignition now has a bright future thanks to the foresight, smart choices and hard work of all those who had a hand in its creation. One of the underscored messages at the JavaOne conference was "Moving Java Forward." This point was highlighted by some of the exciting announcements made about future features of Java. Two new Java advancements announced at the conference were JavaFX 2.0 and cloud computing. JavaFX 2.0 promises the be the future of Java on the desktop, giving Java programs the tools to create compelling and dynamic user interfaces that can be viewed on multiple screen types. It will give Java applications the power to be viewed the same way on a smart phone or tablet as it would be on a traditional desktop computer. Another exciting advancement is Java’s continual push toward cloud computing. Oracle is positioning Java to be "the" programing language for cloud computing. As more and more information is moving to the cloud, Java-based applications will be well positioned to make the transition. Developing a full-featured HMI/SCADA in Java was a road that no one had gone down before. 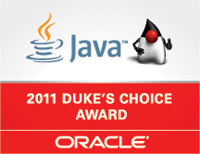 On Oct. 2, 2011 that road lead Carl Gould and Colby Clegg to the JavaOne conference to receive the Duke's Choice Award on behalf of Inductive Automation. Although both Gould and Clegg attended the conference to receive the award, it was not the only thing they took away from the conference. Gould explained: "Being recognized by Oracle with this award is a great vote of confidence in Ignition. The award says that we have achieved something novel and innovative with Ignition; a product that's unique and ground-breaking in the industry." With a continued commitment to blaze a trail of innovative software solutions for the industrial industry, the road less traveled promises to lead to some exciting new destinations.